A CBC spokesperson on Monday denied claims that one of its most prominent business correspondents tried to kill a story involving a bank that funded some of her speeches. 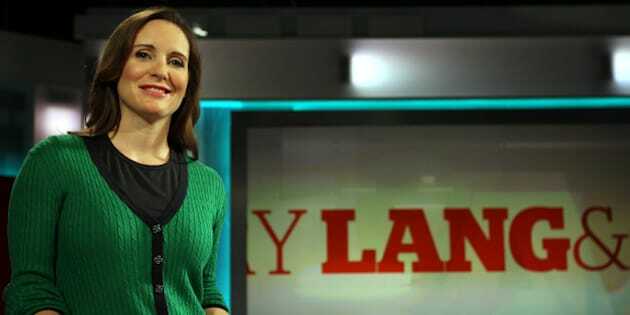 Canadaland reported that Amanda Lang, host of the CBC’s “The Exchange With Amanda Lang,” ran an unsuccessful campaign to halt a story about the Royal Bank of Canada’s use of temporary foreign workers. The site reported that Lang “lobbied aggressively within the CBC to undermine Kathy Tomlinson’s reporting on the temporary foreign worker scandal at RBC,” and cited six instances where RBC funded a speech given by Lang. The report cited “multiple sources” with the CBC who talked on condition of anonymity, as well as Tomlinson’s husband, Alan Fryer, a media consultant and former Washington bureau chief for CTV News. UPDATE: In a follow-up story Monday afternoon, Canadaland alleged that Lang was involved in a romantic relationship with RBC board member W. Geoffrey Beattie since January 2013 at the latest. That would have been during the time when Lang was alleged to have lobbied against the RBC story. "Lang did not disclose this information with her CBC colleagues when she involved herself in the RBC temporary workers story, nor did she make any disclosure to the viewing public when she interviewed RBC CEO Gord Nixon on CBC Television," the website asserted. ... Lang said she disclosed the relationship in 2012 to the public broadcaster, which determined an on-air disclosure before an interview with RBC CEO Gordon Nixon was not necessary. "In the case of my personal life, and the fact that I've been a business journalist for 20 years and have interviewed not just this CEO of the Royal Bank but the CEOs of all of the banks multiple times, long before this relationship existed, we determined that my journalism is not affected and the appearance of it being affected was not an issue," a defiant Lang said. "So disclosure was not deemed to be required." She also addressed the section of Canadaland's report that stated she was paid for speaking at six events sponsored by RBC. "One of them is a charitable event for which I was not paid, the other five were events held by third parties who sought on their own sponsorships from multiple sources," Lang said. "We don't consider as a matter of policy that when there are multiple sponsors it creates an appearance of conflict — it certainly doesn't create at any time any actual conflict — but the appearance of conflict is what the guidelines occupy themselves with, and in those cases that RBC was one of many sponsors, it was not considered relevant. "The characterization that RBC paid me to give those speeches is in fact absolutely false and misleading and Canadaland knew that when they went to press." But the report is “categorically untrue,” the CBC’s head of public affairs, Chuck Thompson, tweeted Monday. He said “many” parts of the story were incorrect, including the core assertion that Lang had tried to stop the story from running. Thompson issued a similar denial about the CBC suspending Jian Ghomeshi last fall, which proved to be incorrect. The Canadaland report comes less than a month after the news site reported that Lang had taken money for appearances from insurers Manulife and Sun Life, and gave them favourable coverage on her show, despite a new policy put into place by the CBC last year to end these sorts of conflicts of interest. “The haters hate,” Lang responded on Twitter. The CBC story in question shook up the political debate surrounding the temporary foreign worker program when it was released in the spring of 2013. The story alleged that RBC was bringing foreign workers into the country for training under the TFW program, and laid-off Canadian workers had been asked to train them. The story was credited for prompting the Harper government's initial changes to the program, as well as RBC's change of heart about using the program. On Twitter Monday many commenters wondered about the sudden rash of allegations of conflict of interest against Canadian reporters. Global News anchor Leslie Roberts was suspended last week after it emerged he was part-owner of a public relations firm. The Toronto anchor confirmed he was part owner of BuzzPR, some of whose clients appeared on Leslie’s show. Roberts said he would be selling his stake in the company effective immediately.